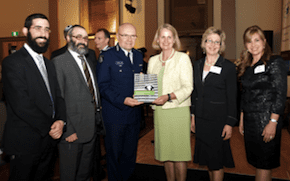 The Jewish Taskforce Against Family Violence together with The Rabbinical Council of Victoria has launched a book…the ground breaking publication, “WILL MY RABBI BELIEVE ME? Will He Understand?” – Responding to Disclosures of Family Violence in a Rabbinic Context. This was the first official function for Chief Commissioner Ken Lay, APM, who gave the keynote address emphasising his commitment to improving the response of Victorian Police to incidents of Family Violence. He paid tribute to his predecessors’ work in this area and declared his intention to follow their lead. He stated his intention to work closely with community organizations such as the JTAFV and RCV to address the devastating realities of Family Violence. Rabbi Yaakov Glasman, President of the RCV paid tribute to the work of the JTAFV by stating that JTAFV are not unsung heroes as their praises have been sung by the Rabbis, by communal leaders and most importantly by the victims of Domestic Violence and sexual abuse. Sheiny New, JTAFV Board member and spokesperson addressed the audience on behalf of the JTAFV. She outlined the history of how this groundbreaking book came to be published, referring to the historically unique relationship between Rabbis and their congregants and how vital a Rabbi’s response is to the healing of victims disclosing family violence and sexual assault. The guests included Mr. David Southwick, Member for Caulfield, Mr. Clem Newton Brown, Member for Prahran, Cr Claude Ullin representing the City of Stonnington, Murray Mcinnis, Vice Chair of White Ribbon Day, members of the Victorian Multicultural Commission, Commander Ashley Dickenson, Assistant Commissioner Luke Cornelius of Victoria Police as well as many of the dedicated police officers who have worked closely with the JTAFV and RCV. There was a large representation from the Jewish community including John Searle, President of The Jewish Community Council of Victoria, members of the Rabbinate as well as Victorian Family Violence Support Services, including Mr. Danny Blay, Executive Officer of “No To Violence”. The Jewish community has swept so much under the rug that one can no longer walk on it. This treatise on abuse and violence in the Jewish family is an eye-opener. This book should not be on the shelf. Rather, it should be in the hands of rabbis, professionals, parents, husbands and wives. The tragic effects of domestic abuse can be prevented, but we must be alert to it. Mazeltov on this great initiative. My organization in Canada has done some work with Rabbis and is interested in deepening this work. Is it possible to get a copy of your publication or is it available online?